We’d love your help. Let us know what’s wrong with this preview of Little Pig Joins the Band by David Hyde Costello. Little Pig has trouble keeping up with his older--and bigger--brothers and sisters. When they get out Grandpa's old marching-band instruments, Little Pig is too little to play any of them. But when the disorganized band has a pig-pile mishap, Little Pig has a BIG idea: They could use a leader. 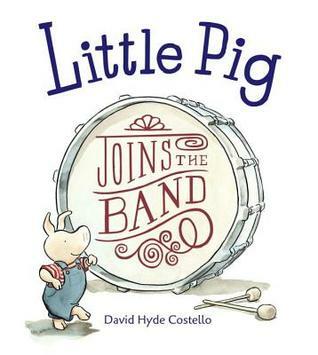 To ask other readers questions about Little Pig Joins the Band, please sign up. Little Pig Joins the Band is a simple and sweet story full of jokes, musical puns, and lovely illustrations. Also, a great book design! A cute way to introduce a couple of instruments within a story to your tot. And be prepared to giggle a little too - music practice isn't all hard work! On a side note David Costello is a wonderful author to have as a program. Our Preschool said, he was "a real treat!" His six foot tall giraffe puppet is absolutely amazing! He also plays the kazoo and ukelele. He introduced his new book "Little Pig Joins the Band." He reads his book "I Can Help" and shows how it can never end. He takes suggestions from the audience for animals to draw and problems they have. The last thing he does is get out his 6 foot tall giraffe puppet and gets a couple volunteers from the audience to act out the giraffe part of the story. The giraffe then takes yes & no questions. The parents were all so impressed that they all bought each of his 3 books. It was a fabulous program. He also draws a quick duck and signed some papers for those who didn't buy books. He is comfortable with children ages 3 and up. Used in Lap Time mainly just reading the large type and it seemed to go over well. Used for Story Time and went over well. The teachers really enjoyed it too. Also used for PJ Story Time. This book's illustrations grabbed me right from the get-go. I enjoyed the plot as well and think it would be a nice book for storytime. It might be difficult because of the characters' dialogues being separate from the story (similar to speech bubbles) but I think it will be okay. I will try it out for storytime soon. This was the first book I read on the new Reading Rainbow app. Levar Burton narrating was a lot of fun. I LOVE the Little Pig series, and this book is just as amazing as the other! The watercolor is incredible, the story is adorable, and it's an all-around genuine book that's full of puns. So--the illustrations. David Hyde Costello pointed out a few things in his illustrations that made me realize just how detailed everything is. I mean, just flip to a random page! Costello took the time to create a floor plan for Poppy's house, and spent the time drawing background photos, books, and everyth I LOVE the Little Pig series, and this book is just as amazing as the other! The watercolor is incredible, the story is adorable, and it's an all-around genuine book that's full of puns. So--the illustrations. David Hyde Costello pointed out a few things in his illustrations that made me realize just how detailed everything is. I mean, just flip to a random page! Costello took the time to create a floor plan for Poppy's house, and spent the time drawing background photos, books, and everything a house usually has, instead of opting for a more simplistic background. That takes a lot of time and talent, and Costello clearly put the effort in to make sure his illustrations are as top as they can be. Also, the story itself is just so wholesome. I mean, I truly can't say no to an impromptu marching band and protagonists coming into themselves. This is definitely a book you all should check out and read!! Little Pig tries several different instruments, but he's too little for all of them. Just when he's decided he's too little to join the band, he realizes he could be the band leader. A cute pick for a music-themed storytime, as it mentions lots of different instruments which you could then talk about with the kids. This book ended up being read daily by my 3 year old son. He loved the simple storyline and learned the names of the instruments - plus we practiced all the sounds they made. A fun book with a great message, that even if you are little you still can lead. There is sweetness and humor on every page. Little pigs and siblings everywhere will feel Little Pigs frustration and cheer at his triumph. Little pig is too little to do a lot of things, but he finds he can still be a leader. This story is a great introduction to instruments and marching band. It's a great story that also could teach youngsters about never giving up no matter how small you are; there is always something you can do to help others. We also listened to the audio of this book and it makes it even more magical! 2. A book review from Children's Literature says, "Little Pig does not enjoy being called "Little Pig" instead of his real name, Jacob. When his older brothers and sisters take out Grandpa's old band instruments, Little Pig is very disappointed to be too small to play any of them. As each sibling takes an instrument and begins to march, however, he notes their disorganization. He decides they need a leader. 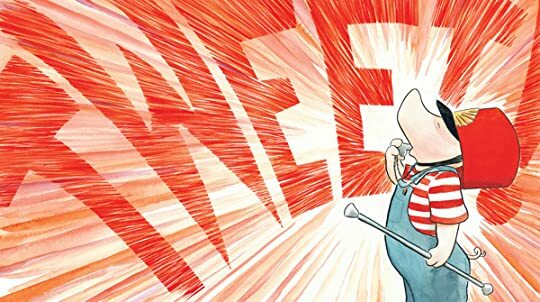 With an ear and double-page-splitting "TWEET" in a red blast of color from a whistle, Little Pig, now in drum major's hat with baton, gets everyone organized. As they thank him, finally calling him Jacob, he decides that "Little Pig" will do. Ink and watercolors are used to visualize this very appealing hero of the light-hearted tale. The anthropomorphic pigs all ignore one another and give comic responses when Little Pig asks for a small instrument. Words hang in the air without speech balloons in amusing asides. The subtle drawing suits the narrative." 3. This a great book for children that are the youngest in their family that may feel a little left out. Little Pig's older brothers and sisters are all playing their grandpa's old instruments and he feels left out because there isn't one that suits him. After going through a bunch of instruments, he realizes that there is a more suitable place for him - the leader position! He gets his brothers and sisters organized (because they were having trouble doing so before) and has fun doing it. The illustrations are very creative and fun and I think children would really enjoy them! I recommend this book as a read-aloud in kindergarten or for a beginning first grade reader. His family all call Jacob, Little Pig, and he is the smallest in his family. So when his siblings get out his Grandpa’s old marching-band instruments, Little Pig has trouble finding one that fits him. He’s far too small for the drums, too little for the trumpet and trombone, and don’t even ask about the tuba! All he can do is watch as his older brothers and sisters march around the room. But when they come to a crashing stop, Little Pig knows just how he can join the band after all. This simple s His family all call Jacob, Little Pig, and he is the smallest in his family. 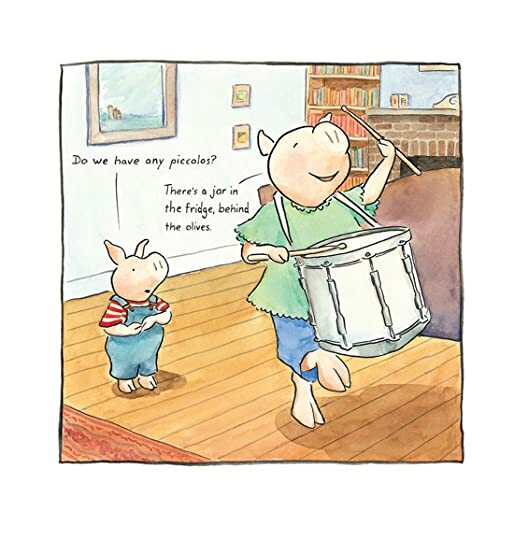 So when his siblings get out his Grandpa’s old marching-band instruments, Little Pig has trouble finding one that fits him. He’s far too small for the drums, too little for the trumpet and trombone, and don’t even ask about the tuba! All he can do is watch as his older brothers and sisters march around the room. But when they come to a crashing stop, Little Pig knows just how he can join the band after all. This simple story speaks to everyone finding their own niche and value in a family. Here, Little Pig finds the special place for himself rather than the older children or adults helping him. It makes for a very powerful message for young children, that not only do they have value but they can discover it on their own. Costello writes with simplicity and a solid feel. His story has small, clever asides that are filled with puns as well. His art is friendly and cheerful. Little Pig has an oversized snout, small eyes and expressive ears. Even the older children are treated as individuals in the art, with one decked out in hat and a boa. I can see more stories about the children in this family. A strong story about finding your place and becoming a leader, this book has a cheery feel that is very appealing. Appropriate for ages 3-5. Little Pig didn’t like being little when his family got out their instruments and marched in a band. He is too little to play the instruments. When he discovers a whistle and a baton and a drum major’s hat, he happily finds that he can join the group. A nice triumph for a small pig, with sweet illustrations. so Margie played the drum. so Peter played the trombone. Little Pig was too little to play the trumpe Little Pig didn’t like being little when his family got out their instruments and marched in a band. He is too little to play the instruments. When he discovers a whistle and a baton and a drum major’s hat, he happily finds that he can join the group. This is an adorable book about a Little Pig that's too little to play the marching band instruments his grandfather sets out for him and his older brothers and sisters to play with. It's great watching the Little Pig try to figure out a way that he can fit in. I love the illustrations. My favorite is the Little Pig trying to play the drum that's way too big for him. All you can see is his little snout sticking up above the rim of the drum. 8/13/14 Used as an opener for music theme preschool storytime. I have an almost entirely new crowd. Left out a few comments and kept a few in. Had to explain some of the humor. But overall this went well and was definitely the favorite of the 3 books. When little pig and his siblings go to grandpa's house, everyone wants to be in the band. Especially Little Pig (who hates that nickname by the way) But he is little, and too small to play any of the instruments in Grandpa's band. But can the littlest member of the band be the most important? He can if he has the right part. This sweet book about finding out where you fit in, is as good for bedtime as it is story time. A co-worker recommended this to me; she used it in a storytime this week. Sweet and funny with all the little asides between the pigs (I don't think she read them as part of the storytime) and with a good message about working together to achieve harmony (literally). Sometimes, it takes a little one to lead us to a solution. A group of children go to Grandpa's house and they get into his old band items. The smallest piglet the siblings call "Little Pig" and he doesn't like it. And everything he tries to do he's to small but everyone else finds what they do best. BUT in the end he comes to the rescue and finds his place. Cute little book. And wouldn't be really hard for a beginning reader. A really cute story about a little pig whose older siblings mostly ignore him. They find a bunch of band instruments at grandpa's house, but all are too big for little Jacob, from trumpet to tuba. In the end, though, he finds something he can use, to help his family turn into a marching band. The story is both about creativity and cooperation, and works very well. Little Pig (no one calls him by his name, Jacob) is too little to play an instrument in the family band, but he is just the right size for what they desperately need - a band leader. Cute, especially for a music theme. I'd give this 2.75 stars. 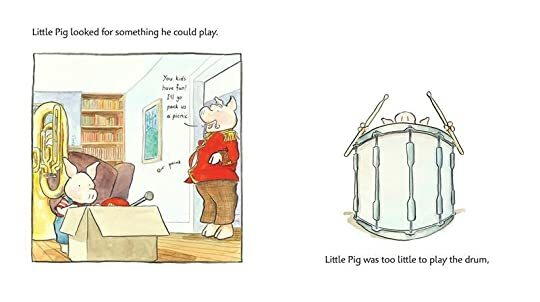 It's nothing earth-shattering, but the illustrations are cute and the too-small pig, Jacob, learns to find his place in the band as a drum major. This makes for a solid themed-storytime pick when covering instruments, music, or being small/too little. 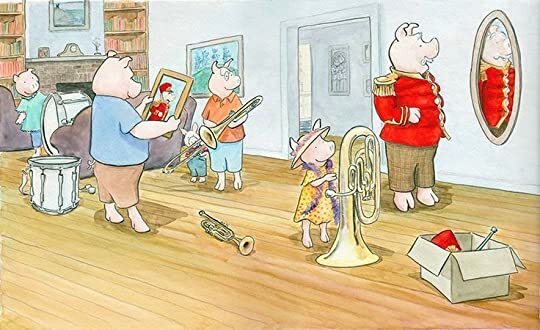 Little Pig doesn't like being little sometimes, especially when it means that he can't get the right fit for an instrument in the family band. He finds out that he can make a big difference despite his small size. I love the classic feel of the illustrations. Some might call this little pig bossy, but I call it young expressions of leadership. Check this one out and decide for yourself! Young leaders (pig or human) unite! Great for Musical Storytelling at Soundbridge. All of the band instruments are too big for Little Pig (who would prefer to be called Jacob). After much frustration, he finally discovers a way he can be part of the band.